Jo is an artist and arts professional with many years experience in sales and customer services having run her own small business over two decades. Between 2006 and 2015 Jo was instrumental in pioneering a fund-raising limited editions programme at the Whitechapel Gallery, London, working with the Gallery's curatorial team and in liaison with leading international artists, printmakers and fabricators to build a highly successful business for the Gallery. Jo is a keen advocate for public sector arts and for making art collecting more widely accessible and democratic. Her skills include exhibition display, artist liaison, editions production and protocol as well as customer-service and sales strategy. She is also knowledgeable about conservation, art-handling and matters relating to mail-order and artwork shipping. During the time Jo managed Whitechapel Gallery limited editions she gained extensive experience of art fairs, having project managed the Whitechapel's successful participation at over 40 fairs world-wide, including The Armory Show, New York; Expo Chicago; Contemporary Istanbul, NADA Miami and Artissima, Turin. Between 2011 - 2014 Jo was key to the project management of an editions consortium: Allied Editions at Frieze London with seven non-profit organisations. Since 2016 Jo has been a free-lance editions consultant, while also running a fund-raising print project called Field Editions - initiated for the commissioning, production and sale of contemporary photographic editions in support of Redeye, the Photography Network, Manchester; Open Eye Gallery, Liverpool and Impressions Gallery, Bradford. In its first year Field Editions produced new limited editions with artists including Rut Blees Luxemburg; John Stezaker; Helen Sear; Ben Rivers; Broomberg and Chanarin and Paul Morrison. Included in the portfolio to date are Susan Derges; Edgar Martins; Kurt Tong, Theo Simpson, Sophy Rickett, Lua Ribeira and many others. Field Editions launched at Manchester Contemporary in September 2016 and since has participated in NADA Miami, 2016, NADA New York 2017/18, Expo Chicago in 2017/18 and will be at fotofever Art Fair, Paris in November 2018. Also established in 2018 was a new initiative entitled NFP Editions (Not For Profit Editions) alongside Tate and The Royal Academy of Art. This new collaboration brings together a variety of not-for-profit organisations, both UK and USA-based, for participation at leading international art fairs. To date NFP Editions includes: Field Editions, Tate Editions, The Royal Academy of Arts and Nottingham Contemporary from the UK; and also New York based projects: Light Work and Art+Culture Projects. NFP Editions successfully launched at Expo Chicago art fair in September 2018 and also participated at The 25th Armory Show, New York in March 2019. In 2015 Jo was appointed an Associate at Counterculture Partnership which is a progressive multi-disciplinary practice set up to help cultural, creative and not-for-profit organisations to plan, manage and thrive. Jo is also a Board Member of the Essential School of Painting, London. 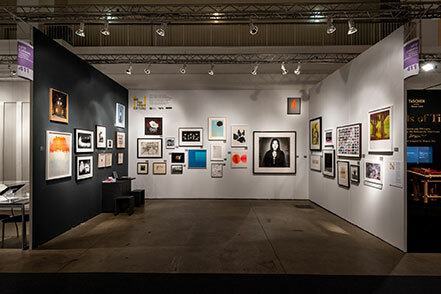 Field Editions, Tate Editions and Royal Academy of Arts at NFP Editions at Expo Chicago 2018. Photo Courtesy of Expo Chicago.